My cunning plan to avoid the mosquitos was to get up really early before they were active. But even though I was early, these Oregon bloodsuckers have a way of being ever ready. 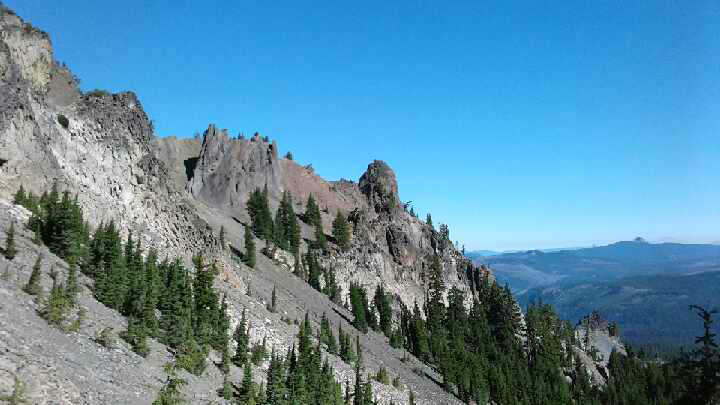 The days hiking was interesting as it wound around mountaintops and through some volcanic rock. There was also a type of sheet rock which gave a tinkling sound as you walked across it. Sounded a bit like a wind chime. Hats off to the trail makers again for the way they have woven the trail into the landscape. There was still a bit of scrambling to be done over the blown down timber but it was not too bad. 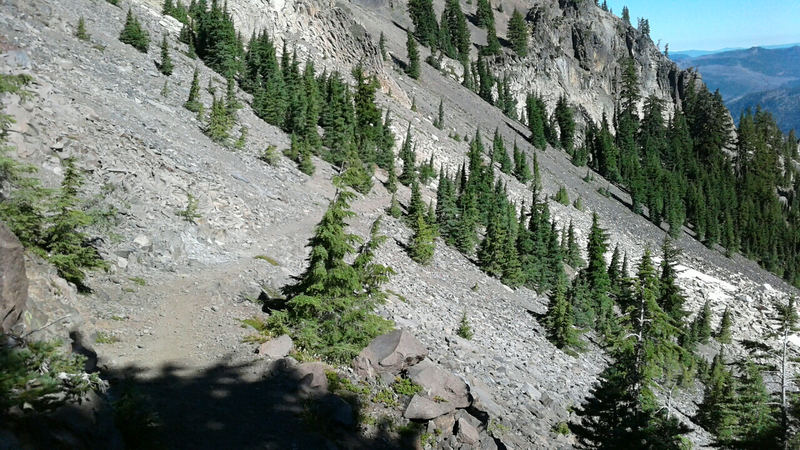 I was heading towards Mazama Village with a 20 mile section without water. So while it meant a carrying a heavier pack, it also meant a break from the mosquitos as I did not have to stop along the way to filter water. 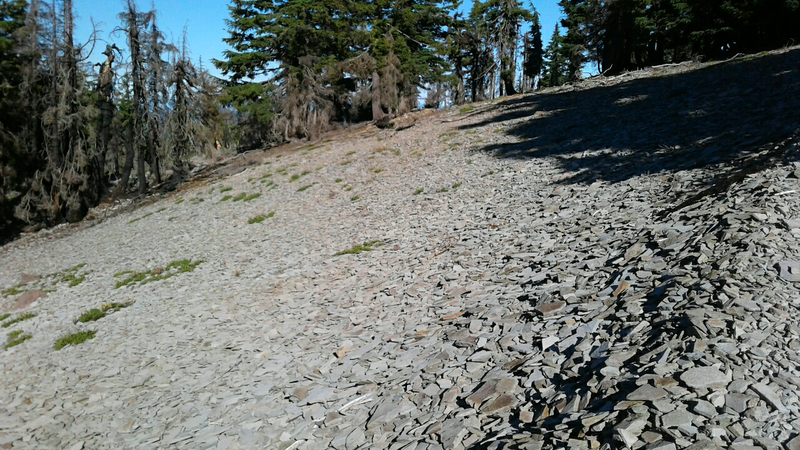 A lot of the rock in this section is volcanic and quite porous which means the water does not stay on the surface. It was quite pleasant walking through the forest. The pine forests are so different to the Australian bush it is always interesting. During the afternoon there was a prolonged burn section and it was good to see recovery was underway with numerous seedling trees sprouting through the soil. There were literally thousands and eventually only a couple will have the room to become mature trees. The fire that is currently burning near Crater Lake is causing quite a bit of smoke in the air. The official PCT trail is closed but I understand that the rim trail is still open. The blowdowns continued and on going over one I slipped and skinned my shin and calf. By the time I cleaned that up the chances of getting into Mazama Village before closing had faded. So I made camp about 7pm with about 9 miles to go for breakfast in the Village in the morning. While Hammer is cranking out the miles on trail, my total distance covered can be counted in metres or yards. I am finding it difficult to get about on crutches. So from being fully ensconced in the PCT thru-hiker bubble for 3 months and loving the simplicity of life on trail I have been pushed back out into the “real world”. With the American election approaching I’ve stayed away from the news and have retreated to a world of books. I’ve just finished reading a book by John Krakaur “Where Men Win Glory. The Odyssey of Pat Tillman”. What a poignant portait of a man who defied clichéd stereotypes and made the ultimate sacrifice for his country. Great to get the updates. Mike thanks from back on the trail and you are writing a good story too!. Love the photos. Meanwhile Stef loving the pics and recovery will come. Agree its a good idea to stay away from the news on the election, although a few (simpson) parodies have made us laugh. Glad you are liking the updates. I am counting the days till we can get back together. On of the good things about being on trail is that we missed the Aus election and all the news here about the US election. Still don’t understand how it works. Sounds like you may have time for several books. I recommend trying one of Bill Bryson’s books for some great humor. I have read several of his books and have enjoyed everyone. Good luck with the rehab on your ankle. My doctor insisted that I participate in a physical therapy program when I had an injury similar to yours. I reluctantly participated and have been thankful every since. I am now a big believer in the benefits of treatment with a skilled physical therapist. Uncanny Dave. I’ve just started Bill Brysons “Notes from a small island”. I have been in touch with my physical therapist at home and she has given me exercises to do. Although not quite as good as hands on. The ortho specialist also stressed the importance of retaining flexibility. So far so good. I have heard that Bryson’s book “In a Sunburned Country” is very good. Thought it might be of interest since it is about Australia. My favorite is “Life and Times of the Thunderbolt Kid”. It is about growing up in America the 50’s. A friend who I had recommended the book to was reading it during a long international flight. He was laughing so much, that the guy in the seat next to him asked him what he was reading. My friend passed the book to him and the guy starts reading and laughing. Before long they had many people on the plane laughing. Also since you are a competitive athlete, you might enjoy “The Boys in the Boat”. Can’t remember the author. It is about the 1930’s rowing team from the University of Washington in Seattle. It is a thriller plus it will give you a flavor of life in the Pacific Northwest. The hardships those kids endured is amazing. Thank you for the recommendations. They all sound good. It is always interesting to see your own country through a visitors eyes. I know Hammer had read “In a Sunburnt Country”. I will look them up. Has of today the west rim of Crater Lake is closed due (8/3/16) to the fire. One can hitch hike on East Rim to the North entrance to get around the fire. Crater Lake is one of my favorite places to see. 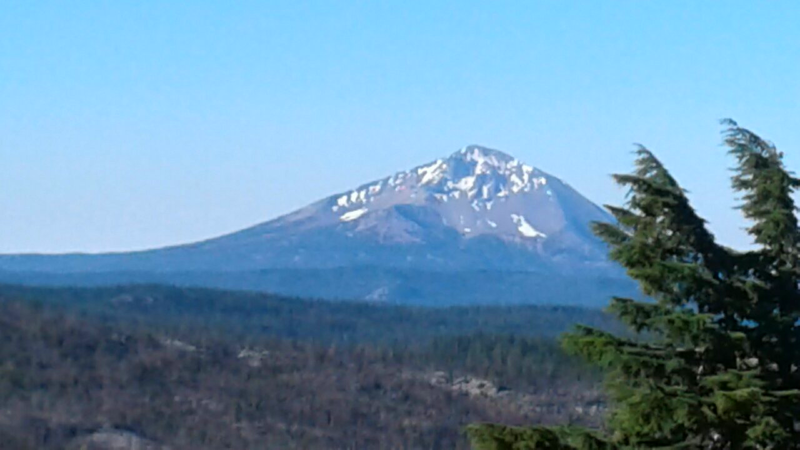 It’s an a amazing place to see and XC ski in the winter And, yes the Oregon mosquitos will keep one on your toes, heels and even fast running pace to stay of the swarm. There is no time in any day when they are not active. I love to read your posts of your adventurous trek . 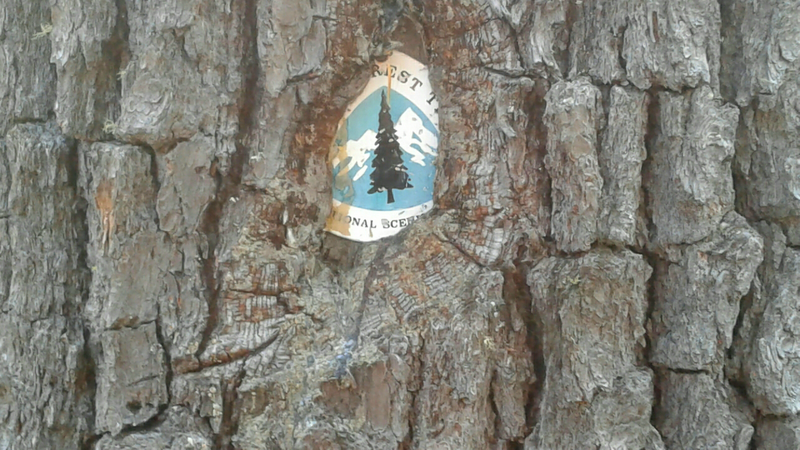 We hiked around 1800 miles of The PCT in the mid 70’s. It was a much harder trail to hike and to navigate in those days. Not to say it’s a very hard adventure to complete today. Sorry to hear about your injury. Great place to rehab in in Sisters. We live in Ashland. Sorry we never meet. I saw the advisory about the closure. I think Hammer was probably one of the last hikers to get through along the west rim before the closure. I can imagine the PCT in the 70’s would have been a much different experience. It did cross my mind a few times when we were out there – how much easier we have it compared to the early days – with the trail maintenance and marking now plus the navigational tools. I am of course disappointed to have the hike over for now. But at the same time I am grateful for the 3 months that I’ve had. Our Ashland experience was not what we planned. We will be back to visit properly. Hi Mike Where are the flower photos? Corky, a good book is ‘All the Light We Cannot See’ – miss your photos and commentary but Hammer is doing a good job. Thank you for the recommendation Tina. And I am glad you reminded Hammer about the flowers. I am happy to see any photos from him. And there is also the Bryson book, “A Walk In The Woods”, about the Appalachian Trail. I think you would get a kick out of that one, too. I don’t know what to tell you about our current election cycle. I live here and I am beyond perplexed! Keep healing! Mike, take care of that skinned knee! Walk in the Woods was my first introduction to long distance hiking many years ago and was partly the inspiration to do PCT. Mike should be midway through Oregon this weekend, although we’ve not been in contact for a few days. Hi Corky, You may enjoy “The Last Season”, a fascinating story of a National Park Ranger who disappears in the Sierra not far from the PCT. 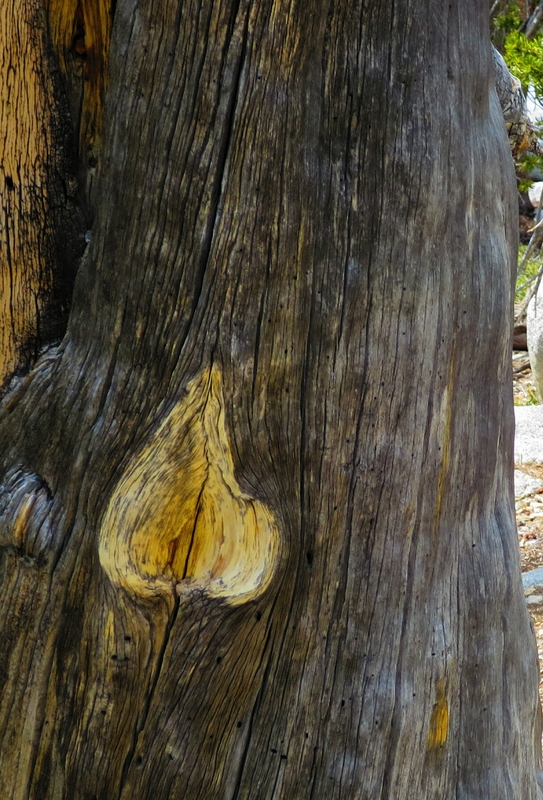 It is relevant for anyone who has hiked along the John Muir Trail and the people who work full time there. Thank you for the recommendation Kyle. Sounds like an interesting read.